Lindsay Morgan, curator of the Art Institute of Chicago’s Thorne Rooms, discusses these intricate dioramas on Feb. 15 at Woodstock Opera House. Jan. 13, 8:30-10:30 a.m. Commemorate the life and legacy of the Rev. Dr. Martin Luther King Jr. Hemmens Cultural Center, 45 Symphony Way, Elgin, (847) 931-5900, hemmens.org. Jan. 14, 4 p.m. Gayle Haas portrays Corrie ten Boom, whose family was arrested in 1944 and imprisoned for working in the Dutch underground, aiding and hiding Jews. After the war, she set up centers in Holland for people of all races and creeds in an effort to bring healing and comfort. Century Memorial Chapel, 523 S. Webster St., Naperville, (630) 420-6010, napersettlement.org. Jan. 18, 10 a.m. Coffee and conversation at 9 a.m. Photographer and preservationist Richard Nickel waged a 20-year crusade to save Chicago’s architectural treasures from the wrecking ball, until his death at age 43 in the rubble of the Stock Exchange Building. Cahan and Williams bring his remarkable story to life. Woodstock Opera House, 121 Van Buren St., Woodstock, (815) 338-5300, woodstockoperahouse.com. Jan. 24, 7 p.m. Challenging conventional wisdom, Aurora University professor Dr. Matt Dabros presents research suggesting an alternative framework in which special interests help to guarantee, not destroy, representative government. Perry Theatre, Aurora University, 407 S. Calumet Ave., Aurora, (630) 844-4924, aurora.edu. Jan. 26, 8 p.m. Dr. David Awschalom, of the University of Chicago, speaks about the remarkable development of a new generation of quantum technologies, an area of research at the border between science and engineering that could change the way we think about information itself. Fermilab, Kirk Road and Pine St., Batavia, (630) 840-2787, fnal.gov/culture. Jan. 29, 2:30-5 p.m. Come in out of the cold and sample delicious wines and hors d’oeuvres, enjoy music and try for raffle prizes, all to raise money for Metropolis Performing Arts Centre. Metropolis Performing Arts Centre, 111 W. Campbell St., Arlington Heights, (847) 577-2121, metropolisarts.com. Feb. 11, 1 p.m. Kevin Wood, appearing as Lincoln, shares some of his favorite stories, anecdotes and jokes, interweaving them with our nation’s history. Q & A to follow. Prairie Center for the Arts, 201 Schaumburg Court, Schaumburg, (847) 895-3600, prairiecenter.org. 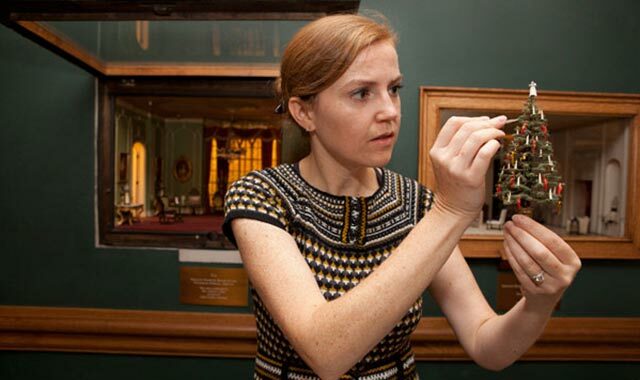 Feb. 15, 10 a.m. Coffee and conversation at 9 a.m. Curator Lindsay Morgan gives a tour of one of the Art Institute of Chicago’s most popular features: the Thorne Rooms, 68 shoebox-size replica home interiors. Woodstock Opera House, (815) 338-5300, woodstockoperahouse.com. Feb. 22, 7:30 p.m. Cheryl Howard performs a theatrical biography of Zora Neale Hurston, a preeminent 20th century African-American author and one of the most important figures to emerge from the Harlem Renaissance. Spartan Auditorium, Elgin Community College Arts Center, 1700 Spartan Dr., Elgin, (847) 697-1000, elgin.edu. Feb. 24, 1-3 p.m. Geologist Raymond Wiggers explores Illinois’ landscape, starting 20,000 years ago, when the terrain was a forbidding ice desert. Reg. req. Hickory Knolls Discovery Center, 3795 Campton Hills Dr., St. Charles, (630) 444-3190, kaneforest.com. Feb. 24, 1:30-4 p.m. Elgin quiltmaker Ina Dews’ play captures how quilts were used to help people escape from slavery by pointing out safe houses along the Underground Railroad. Gail Borden Public Library, 270 N. Grove, Elgin, (847) 742-2411, gailborden.info. Feb. 24, 7 p.m. The Crystal Lake Strikers All-Star Drumline leads groups of outstanding musicians from for a high-energy night of percussion. Proceeds support the Drumline. Raue Center, Crystal Lake, (815) 356-9212, rauecenter.org. Feb. 24, 7 p.m. Geneva’s Natural Resources Committee hosts its 7th annual fundraiser, with proceeds supporting new trees and native landscapes, school gardens, Fox River cleanup and habitat restoration. Stephen D. Persinger Center, 3507 Kaneville Road, Geneva. Feb. 25, 2 p.m. Family fun with story time and a craft. This month’s author is James Dean, who penned “Pete the Cat.” Gail Borden Public Library, Elgin, (847) 742-2411, gailborden.info. March 3, 11 a.m. A presentation about Crystal Lake’s first ladies, including a settler, teacher, organizer, treasurer, postmaster and mayor. Colonel Palmer House, 660 E. Terra Cotta Ave., Crystal Lake, (815) 477-5873, crystallakeparks.org. March 3, 7-9 p.m. Sample artisan cheeses, meats, spirits, craft beer and wine. Reg. req. Arlington Historical Museum, 110 W. Freemont St., Arlington Heights, (847) 255-1225, ahmuseum.org. March 11, 4 p.m. Art historian Jeff Mishur discusses the full range of O’Keeffe’s art, from her daring abstractions to her elegant flowers. Naper Settlement, 523 S. Webster St., Naperville, (630) 420-6010, napersettlement.museum.org. March 15, 10 a.m. Coffee and conversation at 9 a.m. Skinner spent seven years making “Irena Sendler: In the Name of Their Mothers.” The documentary tells of a clandestine network of social workers and nuns who saved 2,500 Jewish children from the Warsaw Ghetto. Woodstock Opera House, (815) 338-5300, woodstockoperahouse.com. This entry was posted on Tuesday, January 9th, 2018 at 11:58 am	and is filed under Mind & Spirit. You can follow any responses to this entry through the RSS 2.0 feed. Both comments and pings are currently closed.